Origami artist Sipho Mabona just pulled off an incredible feat of paper folding, turning a single 50 foot by 50 foot sheet of paper into a life-size paper elephant standing more than 10 feet tall. It was no doubt a painstaking process, but watching the artist and his team in process is strangely soothing. While this video by Shiso Productions doesn't take us all the way to the elephant's completion, it gives an interesting peek at the process—the entirety of which was live-streamed as part of the project. At points, Mabona needed up to 10 assistants to help fold giant swaths of the gargantuan sheet of paper. 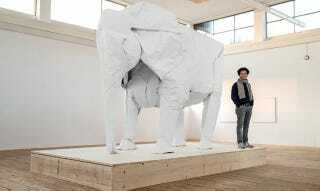 The really fun part is seeing Mabona translate motions from the tiny sheet of paper in his hand, to the small-scale elephant model, to the 50-foot square of paper at his feet. It's about as close as we can get to peeking inside Mabona's mind, watching him figure out how to accomplish the next fold.